Those who serve honourable causes and worship the gods of goodness face dangerous and devious threats. To bolster them in their quests, their religions develop potent techniques and astonishing powers to reward those who follow the noble and devout course without fail. 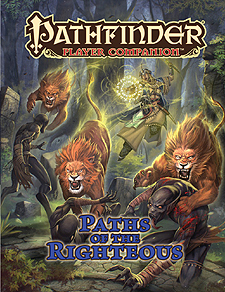 Pathfinder Player Companion: Paths of the Righteous presents more than a dozen prestige classes, each associated with a different good-aligned deity and customized to enhance your gameplay, whether your character's a member of a widespread religion or one that's relatively obscure.